WASHINGTON (CNS) — Senior Airman Zack Mackeller arrived on the campus of The Catholic University of America on a recent Saturday morning with one mission in his heart: to represent young Catholics who are in active military service at the Region IV encuentro. The regional, held in mid-May in Washington, was part of the National Fifth Encuentro process currently underway in dioceses across the United States. Mackeller, 22, is one of many non-Hispanics who have found inspiration from the V Encuentro, as it also is called, to become missionary disciples. He hopes to touch the hearts of others in the military life, particularly knowing the many challenges that they face, such as frequent deployments or the feeling of loneliness that happens when they’re uprooted to new locations leaving behind their communities and support networks. “They have no communities, they have no friends, they have to build straight from the bottom up,” he told Catholic News Service. “I try to engage people as they are, where they’re at,” Mackeller said referring to the opportunity he seeks to evangelize others. The V Encuentro process also has inspired the souls of many military Catholics and their families not only in the United States, but also around the world, wherever Americans in active military duty are located, explained Jose Amaya, director of faith formation for the U.S. Archdiocese for the Military Services. The archdiocese took a creative approach in providing training, course materials and communications online and held the Archdiocesan encuentro last November online and with the help of technology, participants joined from their posts in Japan, Italy, Hawaii and across the U.S.
“We’re participating with two goals: One is to identify what could be done better in regard to ministry with Hispanics in the military, but also the other goal is looking at how to strengthen our priority on young adults in the military,” said Amaya, who noted that young adults represent the largest population in the military. San Juana Morante, another delegate and a military spouse stationed in Hawaii, also traveled to Washington for the Region IV encuentro. She found out about it during a retreat and did not hesitate to answer the call from the Holy Spirit. “Getting involved in knowing God, just me witnessing, me seeing that God is out there and just seeing the light in me being able to show it and seeing his fruits come out, makes me convicted to keep on sharing his love and his compassion for us,” Morante said. Morante, an active mother of two, went from not participating in her chapel community to becoming the president of the Catholic women’s group. She also found a connection back to her faith that goes along with her Hispanic culture and customs. “It’s hard being in the military and leaving your hometown, and you miss the Virgen de Guadalupe, it’s hard moving from state to state and not having it,” she said. 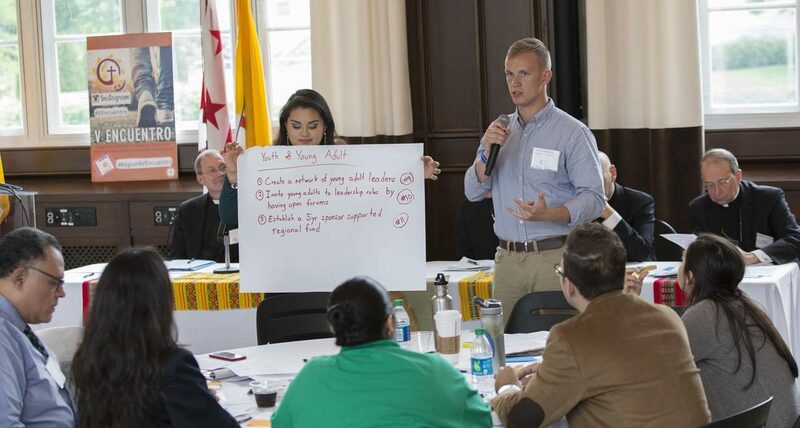 The Archdiocese for the Military Services is already seeing many fruits of the encuentro process in three very important areas: young adult ministry, missionary discipleship and outreach, and faith formation, Amaya noted. “We’re inspiring catechists to be missionary disciples, to be on mission everywhere they go. Not only in the classroom but also everywhere they happen to be,” Amaya said. Dennise Santos, also an encuentro delegate and wife of an Air Force member stationed in Las Vegas, also has embraced the encuentro process and the experiences that come from it. She followed the call to actively invite a stranger into her chapel ministry group at the military base where she resides, and she had no idea about the positive impact she would have in that woman’s life who at first did not feel welcomed going to Mass and had stopped going at some point. Relying on faith and fellowship helps many overcome challenges particularly when their spouses are deployed. Santos remembers a few years ago when she and her two young children were stationed in Japan and the earthquake and tsunami hit while her husband was away in an undisclosed location. “Our family was forced to evacuate and the people who were there for us was our church family. Had they had not been there, had they not had reached out their hands to me, it would have been a very lonely and scary place to be,” Santos recalled while fighting back tears. By sharing a strong bond with other military families through faith and fellowship, they are often transformed into prayer warriors. “Getting together we can help each other out and be la familia (the family) and to be there praying like we’re used to, it’s just drawing us more closer and stronger,” Morante told CNS. Just as Morante and Santos, Mackeller also reminds others that faith is a constant one can always rely on wherever they go.